So I made toast, drank my coffee. Then we decided to go out and try out a new South Indian – Andhraite restaurant. We shared a plate of idli with ghee and spicy “gunpowder” and a plate of sada vada. Then a green moong spicy dosa, crispy kalaxxxxsomething dosa, potato curry on the side. Not bad at all. The filter coffee was way too milky for me, a black coffee type. Anyway, we then went over to buy flahs, flowers, perennials for the front and back. A couple of rose bushes, one yellow, one red, two types of lilies, orange and yellow, daisies, snapdragons. Then stopped at the Indian grocery store where I picked up fresh mint and two medium sized green mangos. And so I made mint chutney, an essential ingredient in The Cheetney Sandwich, recipe for which may be found here. Then I checked into Facebook and partook of witty banter with strangers. All chatter on Facebook, other than political “debate”, is banter and witty, at that. Anyway, I realized that I had been threatening to write down this recipe. I actually have a real picture of the real output of the recipe!! Feel the gourd. This is how I do it. I lay the gourd down lengthwise on a chopping bourd, uh.. board. Then I run my fingers along the surface looking for the very fine nap that covers the outer layer. This is essential for bringing out the essential oils that do nothing for the finished product. Heft the knife. Pick up the sudoku knife and let it rest along the extended palm. The handle should be comfortable, what? Santoku, what did I say earlier? Sudoku? That’s a puzzle. Ok, so feel the knife, let it balance itself into your hand. Then close your fingers around the handle and slice off the left and right ends. Chop up the green chillies. Fine. Rhymes with “wine”, meaning very small. Not fine, rhymes with cine ( ma ), which is French for finished. Set aside. Wash the coriander and chop up, not too fine. Put wok / pan / pot on heat source and bring up the heat. Try not to hum “The Heat is on”. Add oil, about 1.5 teaspoons and let it heat up. 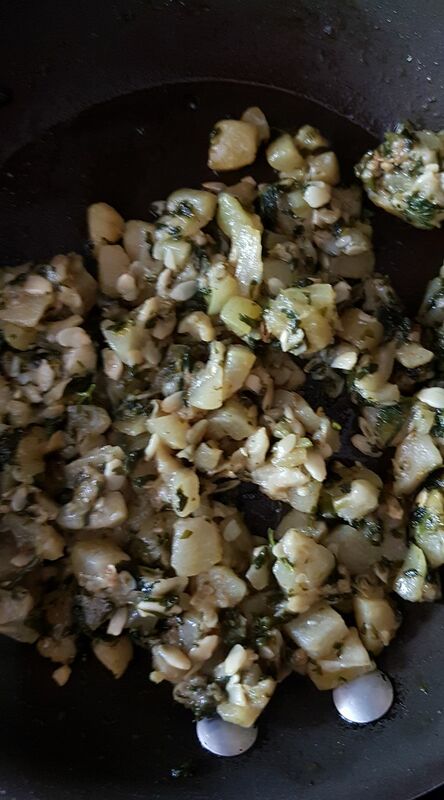 Insert chopped gourd and green chillies into the oil. Stir to coat the gourd. After precisely 2.56353 minutes, add salt. Don’t go crazy here, back it off, because a little bit goes a long way in this recipe. Cover and cook for between 8.56274 and 10.03647 minutes or until gourd goes translucent. Add chopped coriander, stir and let cook for another 2.59757 minutes or thereabouts. I prefer this with parathas. But, I am reliably informed, it tastes great with freshly boiled rice too. Wonders will never cease! We really got a recipe!?? The timing is great…btw don’t throw away the peel, there could be some yum recipe waiting. Yep. I know all about the peels and am saving the recipe for another day! Thank you!